Off the top of your head, you can probably think of three plumbing problems that you’ve encountered more than one time in your home. Professional plumbers know all about these everyday nuisances that can plague even the cleanest and best-maintained plumbing systems, and they’re always ready to help out with skilled repairs that will take care of the problem without causing any damage to the rest of your plumbing. Red Rock Mechanical has worked in plumbing for over 23 years now, and we’ve seen almost every kind of plumbing problem you can imagine, and many you don’t want to imagine. But right now we’ll stick to the simpler kind and talk about 3 standard plumbing services in Burlington, VT that we often perform. If you need any of these basic services—or any of the more unusual ones!—call us right away, any time of the day or night. Unclogging drains: No nuisance problem for plumbing is more common than the clogged drain. Unfortunately, too many people try to solve the problem themselves using chemical drain cleaners. Leave those on the grocery store shelves! They’re bad for your pipes and bad for your lungs, eyes, and skin. Instead, call in a professional plumber, who will use expert tools like motorized drain snakes and hydro-jetters to get rid of the clogs and keep them from coming back. Leak detection: Leaks can start in places where you won’t notice them at first, such as hidden behind walls or under floorboards. When you do suspect you have a leak due to higher water bills, warped floorboards, mold growth, or discolored spots on the walls, you still won’t know exactly where the leak is. 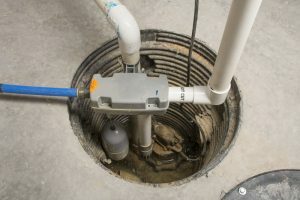 Plumbers will use leak detection equipment and their own skill at spotting leaks to pinpoint the location of the leaking pipe and reach it with minimum disruption to building material. Fixing garbage disposals: You won’t realize how much you depend on your garbage disposal—until it breaks down. Although sometimes restoring the disposal to life is as simple as pressing the reset switch on the bottom of the unit, any more difficult work will require a plumber. You don’t want to risk sticking your hand down into the disposal to try to loosen the flywheel, so let the professionals handle this job. In some extreme cases, you may need to have the whole disposal removed and replaced. Flushing water heaters: If your water heater has too much sediment gathering in its tank, it may start to overheat or block valves. Plumbers can flush out the water in the system to clean it and get the water heater back to normal operation. 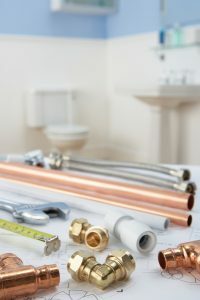 Whatever your needs for plumbing services in Burlington, VT, you can count on the experienced team at Red Rock Mechanical to deliver it for you, done fast and done right. Give us a call today to schedule your next AC repair. There are different procedures to follow depending on the situation, but there are some general steps you should take when it comes to emergencies like huge leaks. Just make sure that one of the steps you take is to call for professional plumbing services if you live in Essex, VT, especially one that offers 24-hour emergency plumbing service like Red Rock Mechanical. We’ve done speedy emergency work for over 23 years, and you can trust us with whatever ails your plumbing. Shut off the water: In most emergency situations, you’ll have serious leaking issues such a burst pipes and broken connections that could cause flooding. You should know where the water main shut-off valve is located and how to use it. (Go learn about this right now if you don’t know it already.) You should also know where individual shut-off valves are for fixtures, so that if one fixture is causing the problem, you can shut if off on its own—but when in doubt, shut down the water to the whole house. Turn of the water heater: You should do this regardless of whether the water heater seems to be involved with the problem or not. Once you turn off the water main, the water heater must go off as well to prevent the water heater from continuing to heat the supply inside it, leading to bursting and the danger of scalding. Call for emergency plumbing assistance: Now that you’ve stopped immediate dangers to your home, stay relaxed and call a plumbing service that offers 24-hour emergency work. Explain the situation clearly to them so the plumbers will be ready with the proper assistance. Temporarily seal leaks: Now that the plumbers are on their way, use plumber’s epoxy or Teflon tape to stop any visible leaks. Place buckets under the leaks as well to prevent as much water damage as possible to your house. If you lack sealant, you can use rags and towels around the leaks to absorb water—these are only temporary solutions for an hour or so, but they will help prevent damage to your home. Use the plunger: If you have sink clogs, take out the sink plunger and attempt to clear the blockage this way. Plungers are safe for plumbing, although not always effective. If the plunger does not work, do not resort to chemical cleaners, which are hazardous for you and your drains. The professionals are already on their way… wait for them to safely fix the issue. Remember to keep calm and carry on: if you have contacted a reliable plumbing service in Essex, VT, you should have few worries no matter the plumbing emergency. With Red Rock Mechanical on your side, you will have the problem fixed in no time. Give us a call today to schedule your next service appointment with us.